Do you what to advertise with us? Thank you so much for your interest in sponsoring Remove My Weight! Sponsorship is a great way to get exposure and make your brand stand out. Remove My Weight receives around 15,000+ page views a month and over 100,000 visitors a year, and has a steadily growing readership of mostly women and about 80% are from the United States. 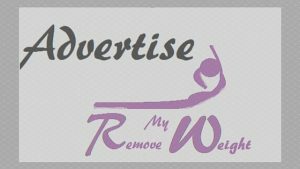 Remove My Weight has been featured in numerous blogs and has several pages that have been shared over 7,000 times, on pinterest alone. I offer affordable advertising options including discount packages for multiple months. If you are interested in reserving a sponsor spot, please email me at support@removemyweight.com and I’ll be more than happy to send you a media kit. Oh Remove My Weight contains paid advertising banners and a few contextual affiliate links. An affiliate link means that I receive a small commission on sales of the products that are linked to in my posts. The products that I link to are only items I genuinely like and are never influenced by advertisers.